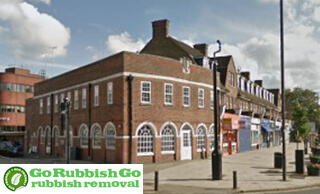 At Go Rubbish Go we’re the leading providers of the premier Pinner rubbish removal services. 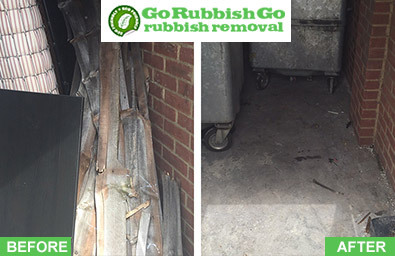 With years of experience catering for the needs of households and businesses in Pinner, we’ve come to the aid of numerous clients and have helped out with an array of different rubbish removal requirements. Whether you have a tonne of rubbish that needs to be removed from your property, or you just have a few bits and bobs that you never want to see again, contact our experts because we’ll make your unwanted items disappear. To get your HA5 rubbish clearance needs sorted once and for all, give our team a call on 020 8610 9182 for a free quote. You want a rubbish clearance in Pinner, HA5 that’s cheap and provides fantastic value for money? Based in Pinner and want to hire the waste collection services of a reputable, local rubbish removal firm? Then your desires are mirrored by pretty much everyone we’ve ever helped in the local community of Pinner. Our rubbish disposal HA5 services reflect what our customers want and need – cheap services that deliver what’s promised and don’t break the bank. 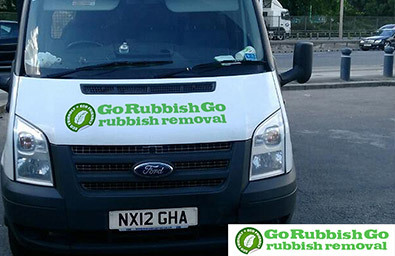 You can count on Go Rubbish Go to provide exactly that. Our price plan is transparent and has been designed to make the entire process easy for you, easy on your wallet. Call now on 020 8610 9182 to get started! There are a number of factors that have made us the first-choice Pinner waste removal company. It’s essentially because we know how to do things; we remove and dispose of rubbish in an ethically sound way, and adhere to all the waste clearance industry standards and regulations, so there’s no chance of getting into hot water due to improper conduct and waste disposal practices. A lot of our success can also be attributed to the hard work and skills of our experts. Everyone we send out to jobs in HA5 has received an extensive amount of training and are therefore clued-up about our operations and the way we do things. The rubbish removal service that I received from this company was utterly fantastic. Their team arrived bang on time and got to work right away. There was no dilly dallying – they simply got on with the job and removed the mountain of rubbish cluttering up my spare room in super quick time. A great service and one that I’ll certainly recommend to all my friends in Pinner, HA5! With us in the vicinity, forget about waiting yonks to get your rubbish disposal needs sorted. Waste removal Pinner can be carried out quickly at a time and date that suits you because we’re available whenever you need us. Our same-day services have proven to be a hit with those in need, so instead of letting your rubbish and unused junk linger around and your waste fester until someone comes round, give us a call and get your requirements sorted out instantly, on the same day. Regardless of what your waste clearance job entails or when you want us to get to work, give us a call because we’ll be able to be of service. The process of getting your waste disposal needs sorted doesn’t have to be arduous. With our company, everything’s about simplicity, about providing you with a simple – yet comprehensive – easy-to-understand service, so you can enjoy a hassle-free waste collection HA5 experience. Everything’s geared towards your needs and freeing your property from your unwanted items. When you call us, you’ll be able to talk to one of our representatives and book a service in a matter of minutes. Then on the day itself, you’ll be treated to a professional and efficient service – exactly what you’re after. Book today on 020 8610 9182 and make use of our low prices. Situated in the London Borough of Harrow in the North West London, Pinner is renowned for being an affluent and relatively wealthy suburb. With its tree-lined streets and grand Edwardian buildings, Pinner screams prosperity and sophistication – a unique area of London. Formerly a Hamlet – Pinner Village – wealth aside, the area has plenty going for it and attracts many visitors throughout the year. Pinner Memorial Park is a must-see local attraction, as is the nearby lake which is a sight to behold. The High Street has a variety of different shops and is the place to go for shopping and eating out. Pinner Tube Station is a short distance away – an underground station running a Metropolitan line service.